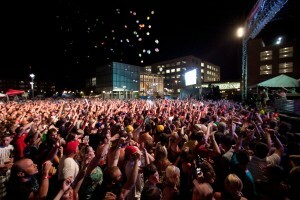 A view of the 80/35 Music Festival. Now just add a Jumbotron! Des Moines is a beautiful and friendly city that has plenty to offer in the heart of Iowa. There is a great mix of downtown city and outdoor scenery, all in one town. It is the most populous city in IA, as well as the capital, with 203,433 residents in the city itself, and 580,255 in the metropolitan area. There is no doubt Des Moines is great city with something for everyone. It may not be the first city that comes to mind when you think of insurance, finance, and business, but it is consistently ranked in the top three in all related categories and is one of the best cities for business. It is also an important city for politics, as it is always home to the first caucuses of the presidential election and draws in visitors for these political events. According to NBC, it is also the “Wealthiest City America” based on their criteria. This means people have disposable income that they are willing to spend to be entertained. Des Moines is home to many outdoor parks, venues, and attractions, and is a cultural center for the state of Iowa. There are 76 parks, and many outdoor areas and venues including the Principal Riverwalk, Brenton Skating Plaza, Gray’s Lake Park, Grand Concourse, Blank Park Zoo, Sculpture Gardens, and many more. Some of the larger events include the Des Moines Arts Festival, Iowa State Fair, World Food Market, weekly farmers’ markets downtown in summer, 80/35 Music Festival, Market Day, ArtFest Midwest, Blue Ribbon Bacon Fest, Celebrasian Heritage Festival, Des Moines Pride Festival, Des Moines Renaissance Faire, Festa Italiana, Festival of Trees & Lights, World Food & Music Festival, Interrobang Film Festival, Latino Heritage Festival, Rib America Festival, Winefest, and Wild Rose Film Festival, and more. Clearly, there is a wide variety of events held all throughout Des Moines. With such a large number of events in a thriving city, events need a way to stand out. 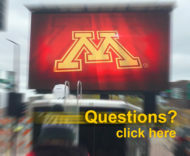 Large LED screens from Fire Up Video can do just that. Our mobile screens make any event instantly more exciting and improve guest experience. These big outdoor TVs are great for a large variety of events. The give everyone in attendance a close-up view of the action wherever they might be. It towers over the crowd and can seen from far distances. And event sponsors love the having the screens at events because it gives them another way to get their message to the crowd. You can play sponsor loops or other messages from all your sponsors, making them happy and returning for future events. Not to mention we can hang banners from the screens, a location where audience members’ eyes will already be focused. Everyone loves the Jumbotron screens.